Dylann Roof sentenced to death. 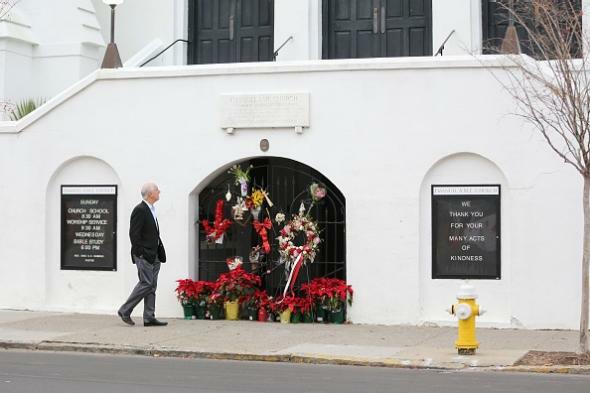 Emanuel AME Church in Charleston, South Carolina, on Jan. 4. A federal jury has sentenced white supremacist mass shooter Dylann Roof to death. Roof was convicted in December of federal hate-crime, obstruction of religion, and firearms charges brought after he killed nine people at the historic Emanuel AME Church in Charleston, South Carolina, on June 17, 2015. He’s the first person to be sentenced to death in a federal hate crimes case. Roof represented himself in the trial’s penalty phase, telling jurors that he still believes he “had to” carry out the attack. He also faces a state-level murder trial that could end in another sentence of death.